How time flies. I got back on the 16th of December, but we were only allowed to return home on the 17 after we have finished our program evaluation. I developed fever, cough and flu, and I just can't wait to go home. And yet I have to moderate the discussion, while the youth leader was moderating the other group. My throat was so dry that I lose my voice. But I guess boredom was my murderer. I could not scratch anyone since government officers were at present, hence I took the picture to satisfy my thirst. That's my fellow team member from Penang. Although I was second in command in the team, I usually asked her for information or confirmation on certain things because there are times I was not paying attention to announcements made by my team leader. BWAHAHHA. I'm just a kitty that wanna play! Funny. I never expected to receive such item from my fellow team member on the 4th of December 2011 in the afternoon. We arrived in Vietnam on that day, and all the Vietnamese participants were thrilled to see their friends coming on board. And they were announcing out loud to the others to view the performances on the port. It was a welcoming reception performance. Many participants went to the 4th floor deck to see it. I could hear the upbeat music playing in the background, but I didn't join them because I was simply busy occupied by my laziness. HAHA. But I was watching the performance from the third floor through a panel glass window - nothing beats the comfort of indoor. I didn't stay long to watch (and I don't remember what I was doing at that time; I only remember that I was busy walking around). Approximately 30 minutes later, I asked one of my team members if the performance was still on going as the music was repeating. I was surprised to hear that the Vietnamese youth were still performing! And they are doing it under the hot sun despite the crowd has faded. Upon hearing it and not wanting the youth's effort to go to waste, I decided to climb 4th floor to join the tiny crowd. I stood beside my fellow team members and hey .. I was just in the nick of time to see the youth performing my favourite Korean song: I AM THE BEST. I sang along, and my body was also moving with the rhythm. As I was singing along, my team member on my right suddenly smiled and said to me "I finally see my AYL (assistant youth leader) smiling." I stopped dead in my tracks, and replied "Have I not been smiling all this time?". The replied was "No ... I rarely see your smile, and this is the first time I'm seeing you in such relax manner." I was actually surprised to hear him complaining about me. Haha. Later in the afternoon, I found a small colourful envelope in my mailbox. 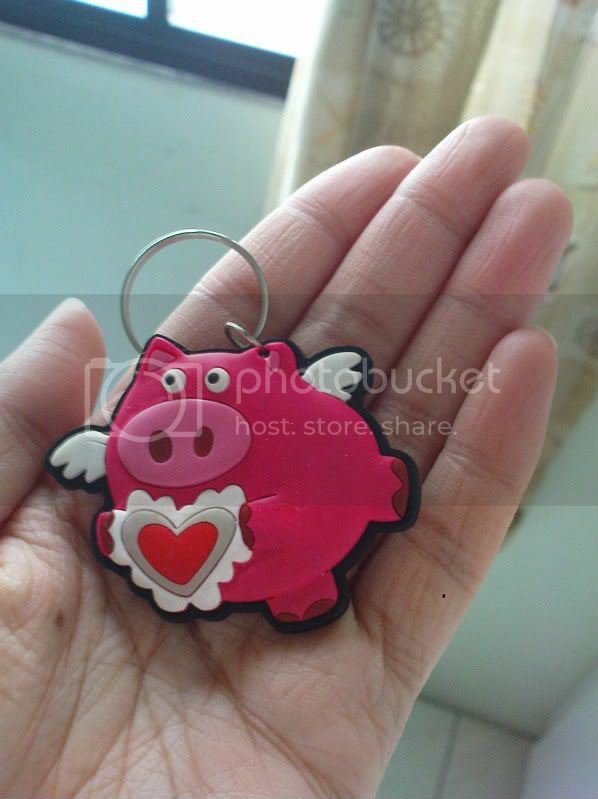 It was a piggy keychain with a message: I finally see you smiling! from the complainer. How sweet. I returned him a thank you message with chocolates within the same day. Bad habits never die, because I like buying lotto. While waiting for my turn to check in at Narita Airport at 9 am-ish, I told my team members that I'm gonna buy lotto. They looked at me without saying anything because they are Muslims. I wasn't disrespecting them or anything... I was just informing them that I'm going to the lotto shop, which is just in front of us. I think they misunderstood that I was asking them to buy along with me because one of them saying they cannot buy even though it's just the scratchy type. No No... What were they thinking?!!! Anyways ... one of them was curious but hesitant so I just dragged her along by assuring her that she would just be escorting me to the lotto counter. BWAHAHA. I bought one and tada .. won 200 Yen! Actually I just got back my capital. Well it's better than nothing! I had strong feelings that I would win when I passed the lotto counters in Japan and the Philippines. If not, I won't be buying. Luckily, my team member followed me because the picture I've taken with my mobile was corrupted. In the SSEAYP program, the participants were allocated to 12 teams with a mixture of participants from other contingents. I was assigned to the I team. These teams are called Solidarity Group, SG, in short. My team is called the SG-I. What a coincidence that SG-I is also the abbreviation of my international organisation. Anyways, back to my entry. One of the activities organised for the SG members was SSEAYP Got Talent. It sounded interesting indeed except it has a twist. The requirements were ... sigh ... every member needs to participate and the members have to create a dance that has modern and traditional dance moves of a particular country (according to draw). And guess what? My team got Thailand. Our team had three Thai members, and two of them choreographed the dance for SG-I. Our dance had two categories: first part is contemporary and second part is modern. We learnt the first part in 30 minutes - 3 days before the competition. And then the second day we learnt the rest. We kept telling each other not to dance well because we do not want to win. If we won, then we would have to dance again on the following day. And that's exactly we do NOT want! So when the competition day arrived ... we all danced without thinking of winning. We in fact had a lot of mistakes, but nevertheless we had fun on the stage amidst of the rocky waves. I lose my balance while dancing not to mention my partner kept on stepping on my foot! I think my SG was dumbfounded. Seriously. I was like 'WHAT???!! What went wrong?? We did everything not to win! Not to dress up and not to dance perfectly!" And yet we won. SG-I is just amazing I guess. We won after just practicing for 3 days, while other groups had been practicing day and night. I guess my SG happened to have wonderful dance teachers. Yes ... SG-I did dance again the following night, but three of my team members including myself didn't because we were involved in some activities that prevented us from performing. I actually regretted for not being able to perform that night, because that would be my last performance to date. But you know what? I don't think I have stage fright anymore. Oh well, we shall see. I would definitely say NO again to my boss to emcee my annual event. I will tell you why I didn't get to dance my last dance if I could find a relevant picture. Hope you guys like the video. SG-I got talent!